Summary: Violence and mayhem ensue after a hunter stumbles upon a drug deal gone wrong and more than two million dollars in cash near the Rio Grande. No Country for Old Men is a 2007 Oscar-winning crime thriller written and directed by Joel and Ethan Coen. 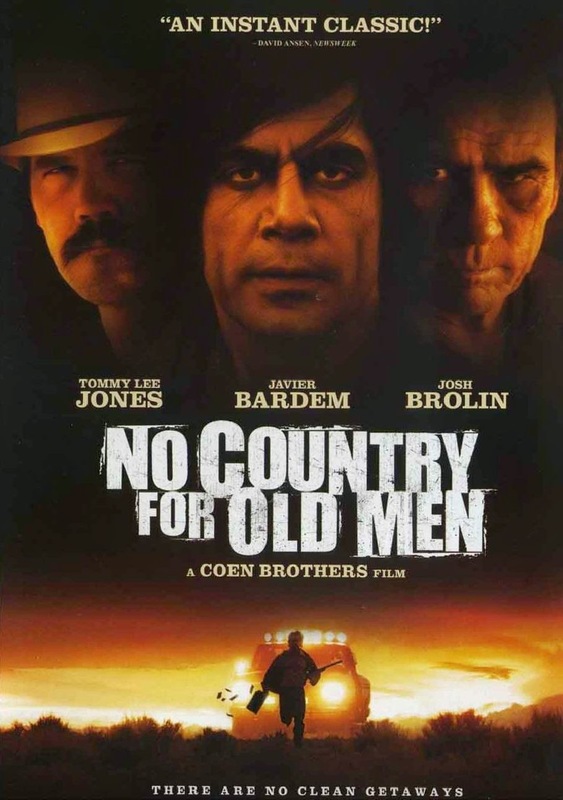 Based on a 2005 novel of the same name by the Pulitzer Prize-winning American novelist and playwright Cormac McCarthy, No Country for Old Men stars Tommy Lee Jones, Josh Brolin, Javier Bardem, Kelly Macdonald, and Woody Harrelson in pivotal roles. The movie is set in the 1980 West Texas and revolves around three men: a welder and Vietnam veteran, Llewelyn Moss, who serendipitously finds in his possession a sum of two million dollars, a psychopathic killer, Anton Chigurh, on Moss’ trail who would stop at nothing in his pursuit, and an aging county sheriff, Ed Tom Bell, who finds himself increasingly incapacitated by the sheer depravity of the criminals he is pitted against. McCarthy's world is a treacherous realm inhabited by unscrupulous, barbaric beings capable of doing the most heinous acts. Vintage Coens, McCarthy's world is on full display here, in all its cynical glory. McCarthy's trademark themes of fate, greed, survival, and death are omnipresent. Another signature McCarthy element that runs through No Country for Old Men is existential nihilism—a motif that also harks back to the earlier, more personal works of the Coen brothers like Blood Simple (1984) and Fargo (1996). The events in No Country for Old Men take place near The Mexico–United States border in southwest Texas. The border, often seen as a dangerous corridor marked by anarchy and mayhem, is a metaphor for the dichotomy that exists between the civilized world that we think we live in and the barbaric world that’s actually hiding behind its goody-goody façade—a recurring pattern in Cormac McCarthy’s oeuvre. It’s no cinch to adapt a McCarthy novel. In fact, most filmmakers would deem his fictional works nigh unadaptable. But, Coens are unlike most filmmakers. By realizing a nigh perfect film like No Country for Old Men, Coen brothers not only attained the remarkable feat of faithfully adapting a highly challenging Cormac McCarthy novel, but, probably, also paved the way for film adaptations of other McCarthy works like The Road (2009), directed by John Hillcoat, and The Counselor (2013), directed by Ridley Scott. Truly, the Coens have a rare gift for storytelling. They are the undisputed masters when it comes to depicting apathetic characters haplessly caught in existential traps awaiting the impending doom. Another great strength of films of Joel and Ethan Coen is the immaculate balance between the technical and emotional elements. Over the years a lot has been said and written about Coen brothers’ ingenious filmmaking style perpetuated through brilliant films like Blood Simple (1984), Miller's Crossing (1990), Barton Fink (1991), Fargo (1996), The Big Lebowski (1998), O Brother, Where Art Thou? (2000), The Man Who Wasn't There (2001), etc. The greatest strength of the Coens is their ability to make films that are simultaneously entertaining and critically worthy, films that often blur the lines between commercial and art-house cinema. 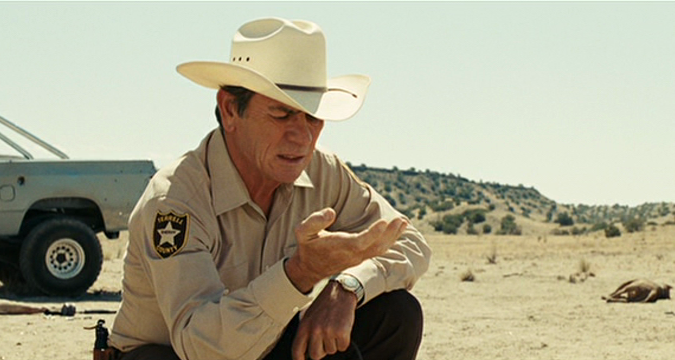 Like some for the best works of the Coen brothers, No Country for Old Men is a difficult film to classify genre-wise. On one hand, the movie’s lurid landscape and starkly somber mood remind one of the Western films of Anthony Mann, Sergio Corbucci, and Sam Peckinpah, while on the other, a strong, pulsating sense of suspense bears a striking similarity to classic Hitchcock films like Strangers on a Train (1951), Psycho (1960) and Frenzy (1972). 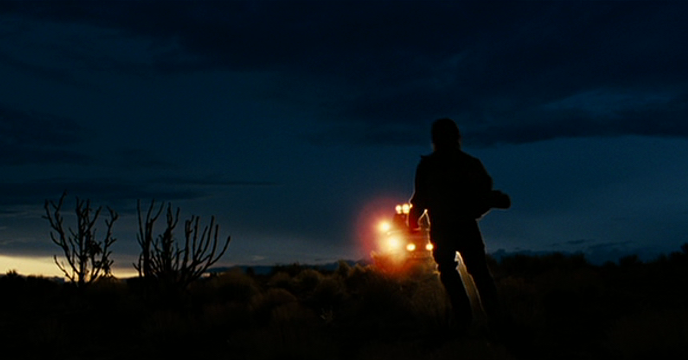 No Country for Old Men has been described by some critics as "Neo-Western" in that it marks a departure from the classical Western ideals such as pride, honor, chivalry and machismo. The movie has also been described as a cross between the Western and Film Noir (while in the former, the protagonist overcomes the enormous odds through sheer grit and determination, in the latter, the hero succumbs to the odds despite being smart and well equipped). This critic, however, best sees the film as an epic battle between life and death, highly reminiscent of the game of chess played between the knight Antonious Block and the Grim Reaper in Ingmar Bergman’s existential masterpiece The Seventh Seal (1957). Ed Tom Bell: How many of those things you got now? Uncle Ellis: Cats? Several. Well, depends what you mean by got. Some are half-wild, and some are just outlaws. Ed Tom Bell: I always figured when I got older, God would sorta come inta my life somehow. And he didn't. I don't blame him. If I was him I would have the same opinion of me that he does. Uncle Ellis: Whatcha got ain't nothin new. This country's hard on people, you can't stop what's coming, it ain't all waiting on you. That's vanity. Anton Chigurh: You know how this is going to turn out, don't you? Anton Chigurh: I think you do. So this is what I'll offer - you bring me the money and I'll let her go. Otherwise she's accountable, same as you. That's the best deal you're gonna get. I won't tell you you can save yourself, because you can't. Llewelyn Moss: Yeah, I'm going to bring you something, alright. I decided to make you a special project of mine. You ain't going have to come looking for me at all. McCarthy’s dialogue is often cynical and replete with philosophical and spiritual overtones. Here, this critic would like to draw your attention to the following monologue (delivered as a voiceover at the beginning of the film) by Tommy Lee Jones’ character, Sheriff Ed Tom Bell: “The crime you see now, it's hard to even take its measure. It's not that I'm afraid of it. I always knew you had to be willing to die to even do this job. But, I don't want to push my chips forward and go out and meet something I don't understand. A man would have to put his soul at hazard. He'd have to say, ‘O.K., I'll be part of this world.’” Like any quintessential Coen brothers film, No Country for Old Men has a strong undercurrent of dark humor that makes it superior to other films of its ilk. Coens often purposefully make their characters look ridiculously naïve to their audience. 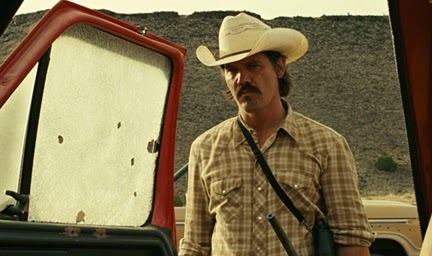 Take, for example, the case wherein Llewelyn Moss (Josh Brolin’s character) guiltily returns to the scene of the shootout with a gallon of water for the wounded driver. Firstly, he doesn’t pay heed to the possible repercussions if he got found at the crime scene by either the police or the drug mafia. Secondly, he never bothers to weigh the odds of a severely wounded man surviving without water and any medical help for hours in the middle of a desert. In yet another display of dimwittedness, Llewelyn remains blissfully unaware of the presence of a tracking device (for the better part of the pursuit) in the satchel containing the two million dollars that he finds at the shootout scene despite being repeatedly traced by Chigurh. Obviously, a War veteran is supposed to act a lot smarter than that. The major characters in No Country for Old Men are no less interesting than the dialogue itself. The movie’s antagonist Anton Chigurh is easily the most chilling hitman in all literature or cinema. Chigurh can make the meanest of villains look like sissies. He may be described as an angel of death, a Terminator-esque Boogeyman of mythic proportions, or, more accurately, as a cross between the Grim Reaper and a diabolus ex machine. He is the perpetrator of all evil or so it seems for the most part. He kills with a cattle gun that shoots out a little rock to drill a hole into the victim before it gets sucked right back in. In the name of fairness, he usually lets his victims decide their own fate by allowing them to make the call during a coin toss. As the plot advances, Chigurh’s motives and actions become increasingly questionable. His ominous presence can be felt even in those scenes wherein he is either physically absent or not visible to the viewer. One just can’t help but sense the constantly lurking danger much like the menacing impact of the mysterious truck driver in Steven Spielberg's Duel (1971). But, in McCarthy’s treacherous realm, even Chigurh is not safe as evident from the devastating car crash sequence near the end of the film. 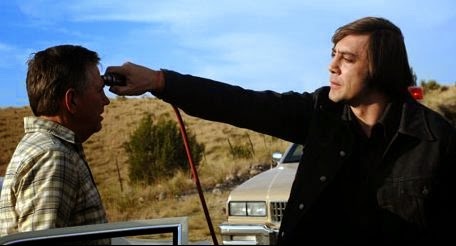 A bounty hunter, Carson Wells, describes Chigurh in the following words: “No, no, you don't understand. You can't make a deal with him. Even if you gave him the money he'd still kill you. He's a peculiar man. You could even say that he has principles. Principles that transcend money or drugs or anything like that. He's not like you. He's not even like me.” The part of Chigurh is played with scalpel-like precision by the renowned Spanish actor Javier Bardem, who deservedly won an Oscar for his menacing portrayal. Tommy Lee Jones’ laconic Sheriff Ed Tom Bell (a mesmerizing performance by Jones) is a master storyteller in his own right. Sheriff Bell often recounts interesting anecdotes, narrates tales of his ancestors; even his dreams have the quality of a well spun yarn. In this regard, he comes across as a distant cousin of Joseph Conrad’s Charles Marlow. Sheriff Bell longs for a time long gone. He is sick and tired of violence and outrage of our times and his mind wanders more often than a police officer on duty can afford. So, he retires thinking that he cannot outwit the criminals anymore. But, being a man of action, much like his father and grandfather, Sheriff Bell remains restless even in retirement, perhaps still horrified by the idea of a homicidal lunatic being on the loose—one he failed to apprehend despite his best efforts. Josh Brolin’s Llewelyn Moss (a career-defining performance from Brolin) is all brawn and no brains. His machismo is typical of a Western hero, but, as is so often the case with Noir protagonists, his vanity becomes his greatest undoing. At crucial junctures he makes terrible blunders, thereby setting himself on a fast path to destruction. 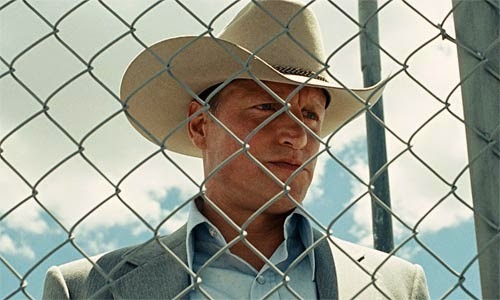 The support cast does a brilliant job of backing up the movie’s leads: Woody Harrelson, Kelly Macdonald, and Barry Corbin deserve special mention. 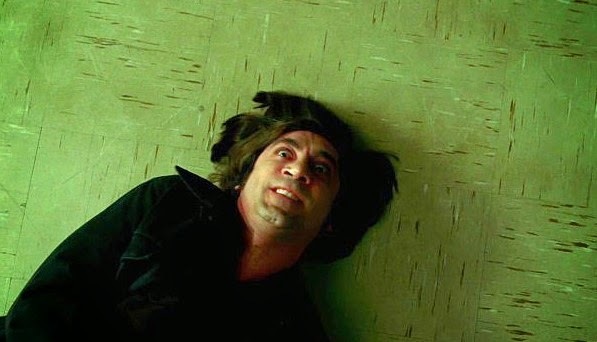 Overall, No Country for Old Men is a product of great creative ambition and technical brilliance. It is a powerful exercise in filmmaking that transcends genres and fades the line between mainstream and arthouse cinema. Roger Deakins’ splendid cinematography adds color and life to the film. Like all the films of Joel and Ethan Coen, there are a few experimental shots which speak highly of the film’s technical supremacy. Carter Burwell's sparsely used background score accentuates the movie’s stark and eerie mood. The top drawer editing by Coens, credited under the alias Roderick Jaynes, ensures that the movie’s narrative advances at a rollicking pace. There are few contemporary filmmakers who are better at devising a multilayered narrative with a perfect mix of crime, drama, adventure, suspense and quirky humor. The late American film critic Roger Ebert eloquently describes No Country for Old Men as “a masterful evocation of time, place, character, moral choices, immoral certainties, human nature and fate.” Like any true work of cinematic art, No Country for Old Men gets better with each viewing. Each time it offers something new to ruminate upon for a thinking viewer. As far as this critic is concerned, No Country for Old Men is fast climbing up on his list of all-time favorite Coen brothers films. No Country for Old Men is quite high on gore, and those with weak hearts are advised to stay away from it. But, those who do choose to watch it should expect nothing less than a rollercoaster of a ride. While the movie’s ending may disappoint the curious lot, the journey alone is worth the time and indulgence. Highly recommended!